What Is the Difference Between Raw & Roasted Cashews? Why Do Cashews Cost More Than Peanuts? Peanuts are popular, inexpensive and versatile. 4 What Is the Difference Between Raw & Roasted Cashews? Cashews and peanuts are commonly eaten together in nut mixes, but there is an appreciable difference in price between these two nuts. As of 2013, peanuts typically sell for about $3.50 per pound while cashews typically sell for about $10 per pound, a price difference of nearly 300 percent. This price difference is partly the result of market conditions, such as the greater popularity of peanuts, but it also stems from differences in the nuts themselves, as peanuts are much easier to grow and bring to market. According to Matt Rudd of the London Sunday Times, as of 2013 the world consumes 34 million tons of peanuts each year, as opposed to only 2.7 million annual tons of cashews. Because growers and brokers around the globe sell more than 10 times as many peanuts as cashews, they are able to implement economies of scale for peanut production that they can't implement as easily with cashew production. These economies of scale contribute to the lower price of peanuts relative to cashews. Cashews grow on trees, which also provide a fruit called the "cashew apple", the swollen sweet stem of the cashew plant. Each cashew apple has a kidney-shaped growth attached to its bottom, which contains the cashew nut. In contrast, peanuts are leguminous plants, making them technically vegetables rather than nuts. Peanut plants typically take about 120 days to mature and they are replanted every year. Cashew trees take years to get established. Peanut farmers can have crops ready almost right away, while cashew farmers spend years tending their trees before these crops yield food that can be sold. 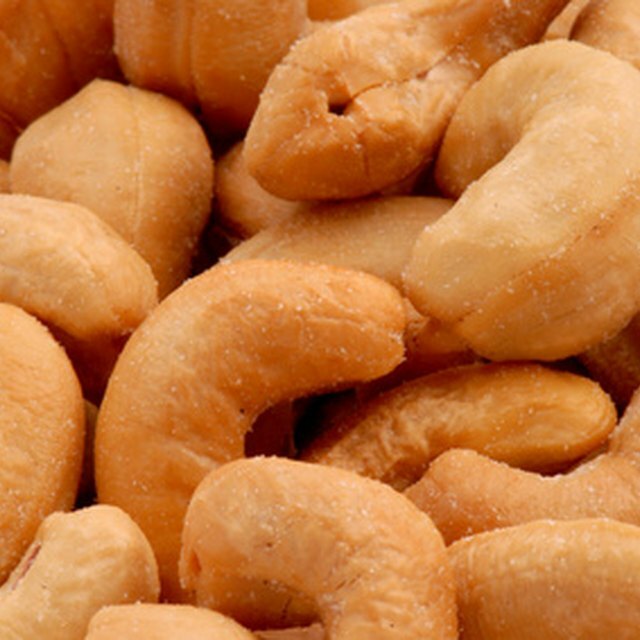 Cashew nuts grow in tropical regions such Vietnam, Brazil and India. The ideal daytime temperature for cashew trees is around 77 degrees Fahrenheit. Although peanut plants require full sun and are typically grown in warm southern climates, they can be grown in northern climates as well as long as they are started indoors and then moved outside once soil temperatures reach about 60 F. Because peanuts can grow in a wider range of climates, they are more readily available and therefore less expensive than cashews. Peanuts simply need to be roasted or shelled and boiled, and they are ready to be enjoyed. In contrast, cashew nuts grow in a shell filled with a caustic liquid that can cause severe damage to human skin. Freezing the cashews in their shells helps to separate the nuts from this dangerous substance, although it is still advisable to wear gloves when shelling them. These extra precautions make it more labor-intensive to shell cashews and ready them for market, therefore increasing their price.